Thanks to the One2One Network, I have a new album on my Zune playlist!!!! 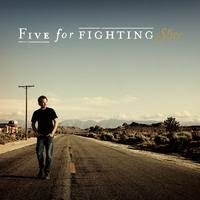 I'm "enjoying a slice of American pie" listening to Five For Fighting's new CD, Slice. I really love the songs on this album including Hope, Story of Your Life, Chances and Note To The Unknown Solider. This album genre is acoustic rock. "If every album provides snapshots of where an artist’s mind at heart is at the moment, Slice, the latest offering from John Ondrasik (aka Five for Fighting), is a collection of digital jpegs and faded Polaroids. The album takes stories of friends, family and even American servicemen, and sets them to music shot through with the spirit of the great songs of his youth. It’s a diary, or a blog, in which Ondrasik speaks his mind about current issues, experiences and sentiments, while setting those thoughts to piano, bass and drums." The CD will be released on October 12th! One of my readers will win A FREE AUTOGRAPHED CD of Slice! Besides his song "Superman", this is the first time that I've taken the time to listen to Singer/songwriter John Ondrasik work. I added several more of his albums to my playlist today, too! I'm super excited about the music on this CD as well as learning about this awesome Artist! * John has a charity driven website: whatkindofworlddoyouwant.com that raises money for various charities when users view video clips provided by visitors to the site. Current views are over 3 million with approx. $300,000 donated. He is also a huge supporter of the US Troops. He created and produced "For The Troops", a free CD for every active service person in US Armed Forces. Entry: 1) Tell me what your favorite Five for Fighting song is! You can hear Chances here! This must be done to enter the giveaway! Leave your email at least one time. Make a comment for each entry! 1) Follow my blog on Google Friends Connect. ENDS October 28th. US only. Winner will be chosen by Random.org & will have 48 hours to respond to my email. Chances is my favorite song by him. I love "100 Years" Great Review!! I am torn. My favorite Five For Fighting song is 100 years but I also like "Dying" Thank you for a great giveaway! Fan of Five For Fighting on Facebook. Thank you again for the great giveaway! I love FFF's The Riddle! I follow FFF on twitter! My fav is definitely "100 Years!" Thanks for playing! This giveaway has ended! Do a twitter search and you will find more giveaways for this awesome CD! kaleakane was the winner!!!! Congrats! Check your email and send me your address to pass on to my sponsor!! !